But I’m an illustrator…artist’s statements are for fine artists…why should I need one…? In addition to having an effective bio statement, these days, illustrators need to have an artist’s statement. And whether it is written by the illustrator or written by a “ghost” writer, an artist’s statement can provide desired information to a reader in the absence of the illustrator, or even examples of their work. Many people don’t realize that most fine artist’s have more than a single artist’s statement, and in fact may have created several of them. They most likely will have a general statement, which is meant to serve in non-specific situations, such as online, social media postings, or for other media publications. Artists will also create specific artist’s statements, that each pertains to a specific art installation, or to a thematic body of work. So some artist’s who explore a variety of different directions for their work may have written a number of individualized statements. An artist’s statement would be more aptly titled, “an artist’s ‘art’ statement”, for it is really the art itself that is being written about, not so much the artist. One way to look at it is as a biography, not of the artist, but of the artist’s work. Another way is to think about it is as a story of your art. It is important to remember that an artist’s statement is not strictly speaking a personal biography, although it usually contains biographical elements for the purpose of establishing a context for the artistic narrative. Let your bio do the job of providing information about yourself, position, qualifications and, achievements. Allow your artist's statement to speak about your art. There is some debate concerning whether an artist’s statement should be written with a first person or a third person voice. Depending on the purpose for the statement it may be appropriate to use either. The first person voice is a more personal way of stating things. The third person voice is considered more formal and impersonal. Many fine artist’s prefer to write using first person form, especially for exhibition specific explanations their work and processes. For this sort of purpose, the first person form is perfectly appropriate, whereas for a more general, holistic purpose, the third person form would most likely be more beneficial. my ongoing series that is based on the perceptual effects of association and geometric logic. They are concerned with the unraveling and/or building recognizable patterns, and a search for meaning in the discovered forms. The composition, surfaces, and elements within the image suggest possible identifiable, familiar human traits, expressions, etc. I call on each viewer to exercise his or her own set of visual beliefs. However, the number of elements and inconclusive suggestions for a viewer invite them to constantly reevaluate their perceptions. My process of creating the works involves an investigation into decision-making, connoisseurship, intuition and serendipity. All bear a central role as intangible influences on the effect of a completed work. Viewers are engaged in the process of forming images in an attempt to define their own parameters for the image. The complexity of elements within the images challenges the attention capacity of the viewer compelling them to engage in their own manner of perception, judgment, and discovery. 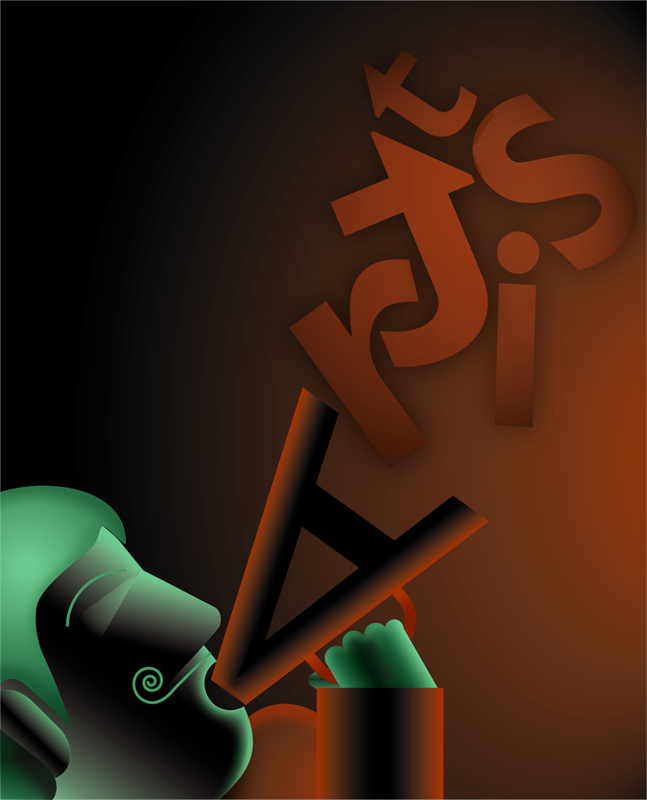 My work is created digitally using raster and vector based software programs. There is no acquired imagery of any kind used. All forms, textures, objects, and lighting effects are digitally created. All elements are prepared in Illustrator, exported to Photoshop, and customized for final output. Don Arday is Professor of Illustration in the School of Art at Rochester Institute of Technology. He has produced award-winning illustrations using computer media for Forbes, Coca-Cola, AT&T, Pepsi, Sprint, Fidelity Investments, and CNN to name a few. The work shown here presents narrative themes. The illustration themes were inspired by story concepts, content, and context. Although the images were created for a particular story, seen out of context, the narrative works invite the viewer to define their own version of a story, which will be influenced by their own history and associations. Several works were commissioned for corporate and consumer publications. 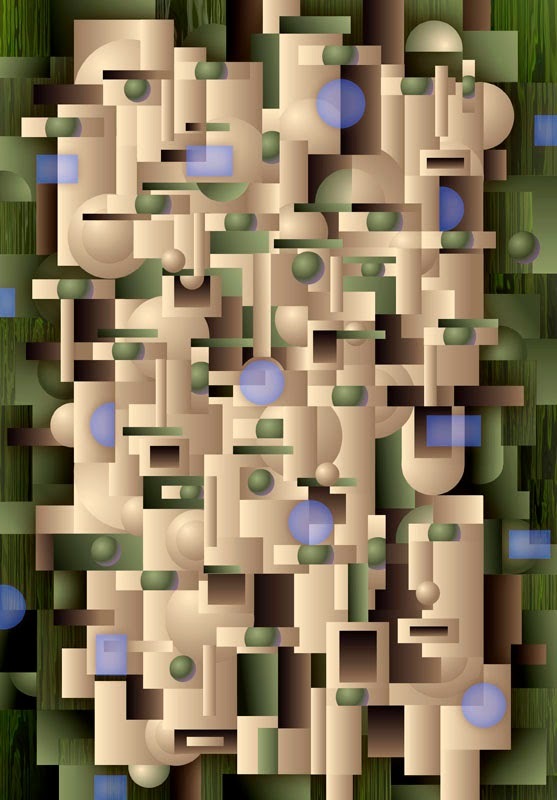 The works presented are created digitally using raster and vector based software programs. There is no acquired imagery used in any of the works. All forms, textures, objects, and lighting effects are digitally created. All elements prepared in Illustrator, exported to Photoshop, and customized for final output. The physical appearance of the art should be briefly described. Although artist’s statements are usually seen in context with an exhibition or examples of the art, sometimes they are not. Using distinguishing adjectives to help describe the art can add interest for the reader. Example: Described as logos on steroids, the bold geometric forms in Don’s illustrations give them an iconic appearance. All art, or in our case illustration, has a place among other art and illustration. And is usually influenced if even subconsciously by other art. Influences are appropriate within this context. Example: The illustrations evoke the mechanical simplicity and directness of early 20th century applied advertising art as well as other art genres such as Art Deco. As artists the directions our work takes and what we wish to express within our work are often influenced by our past personal experiences. Each and every artist has a unique background, which shows itself in the personal preferences that influence the appearance and provide an inspirational basis for our work. Example: Having worked as a graphic designer for many years, Don applies a conceptual methodological approach to create inventive visual interpretations of narrative subjects. Readers and viewers of the work will be interested in how it was achieved. What media and or materials were used, and the way the media was applied to create the work—in other words the artist’s artistic process. Whether the art was produced with traditional materials and methods, using digital techniques, or a combination of the two, this information should be provided in an artist’s statement. 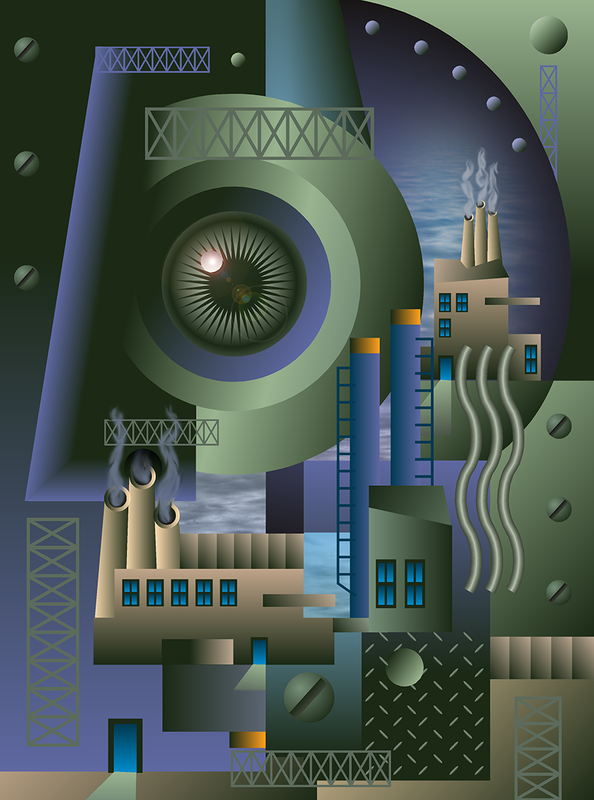 Example: All of Don’s illustrations are a combination of vector- and raster-based digital software. By combining Adobe Illustrator with Adobe Photoshop Don is able to utilize the best of both digital environments. The “drawn” portion or basic structure and coloration of an image are laid out in Illustrator. Don’s work requires the utmost placement and compositional accuracy. From there the “design” is exported to Photoshop where photographic and painterly techniques are applied. All textures and any environmental effects such as wood grains, or cloudy skies are digitally created if not in Photoshop, then by using Daz 3D Bryce. If there is an ideology that underlies aspects that appear in the artwork, then it should be explained. A body of work usually has thematic overarching concepts that weave though it. An artist’s statement identifies and explains the context for these aspects and concepts as they relate the work. Illustrators may not realize it, but the reasons behind the decisions that are made in the work are of interest to an audience and are equally as important as the physical aspects displayed in the work. Example: Abstraction of form and a deliberate visual understatement of detail are themes common in Don’s work. The images call on the viewer to understand a narrative that is visually presented as a combination of simplified geometric forms. The abstractness of form gives the illustrations a unique identifiable style. • Quotes about your art made by others such as clients, art reps, and colleagues. • Uncommon language, such as colloquial slang, or invented phases. • References to little known sources that require their own form of explanation. • The mention of other artists for the sake of comparison or name-dropping. • Non-relevant information such as statements that are off topic. • A diatribe or any other form of criticism. • Imperative statements that appear as commands or directives to the reader. • Exclamatory sentences that display excessive emotion. Your artist's statement should be carefully composed. It is important that there be no typos or improper use of language. You will most definitely benefit from having someone else take a look at it to get a second opinion.